UNSW Oceanography is involved in a wide variety of estuarine, coastal and regional research projects including the following major projects. Ocean surveying in progress includes Acoustic Doppler Current Profiling (ADCP), Current Temperature and Depth (CTD) profiling and BioGeoChemical (BGC) sampling. These measurements are generally taken by surveying from UNSW or SIMS boats. In addition, NSW-IMOS supports an array of in-situ Coastal and Shelf Moorings. These Morring arrays are located within the Batemans and Solitary Islands Marine Parks, as well as off Sydney and Port Hacking (see Moorings page for a chart of mooring locations). Batemans and Solitary Islands Marine Park mooring arrays are retrieved and redeployed by the technical team every 6-8 weeks. Sydney moorings are serviced by Oceanographic Field Services. Data from the moorings is processed in house at UNSW and then uploaded to IMOS where it is freely available to other researchers as part of a nationwide mooring monitoring system. This data forms part of a developing dataset which contributes to the understanding of Australias marine systems. Open access to this data set is available from the Australian Ocean Data Network (AODN) Portal, a National Collaborative Research Infrastructure for Australia (NCRIS) Project. NSW-IMOS in collaboration with the Australian National Facility for Ocean Gliders (ANFOG) also run seasonal glider missions along the NSW coast to better understand the hydrography of the region. A good summary of this research is available in Schaeffer et al 2016. Figure 1: Temporal coverage of NSW glider deployments. Nemo refers to Slocum and Dory to Seaglider deployments. Latitude range also shown. Light grey colour indicates glider off shelf (>200m). Connectivity, the exchange of propagules between habitats or sub-populations through larval dispersal, has major implication in ecological and evolutionary processes. For instance, it influences species geographical ranges, population replenishment, gene flow, etc. Consequently, knowledge on larval transport patterns is necessary for the development of adequate adaptive management of marine resources. Recent literature shows a strengthening of the Eastern Australian Current (EAC) and a further pole-ward penetration into the Tasman Sea; these changes might extend or shift southwards the geographical range of tropical and temperate species. However, larval dispersal patterns provoked by past and current circulation regimes within this region remain elusive. 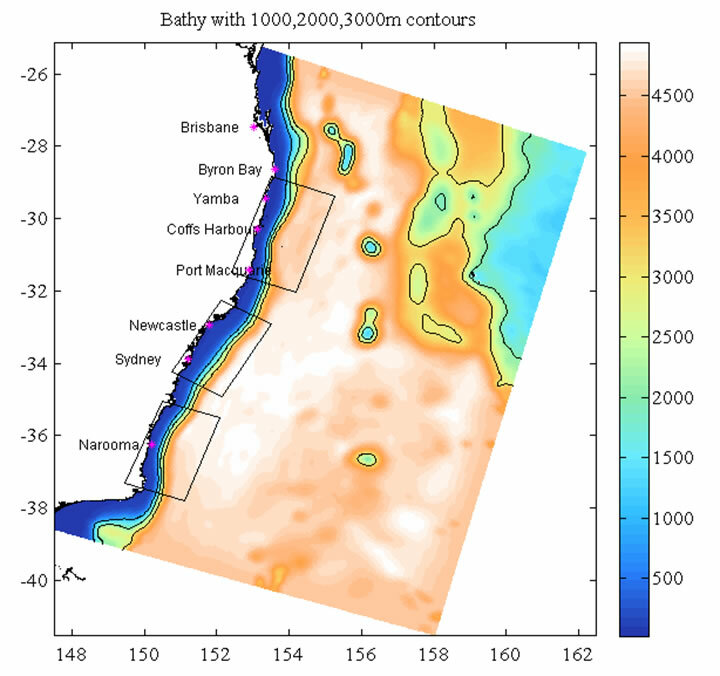 This project studies the mechanisms that drive particle transport along the south-eastern Australian coast. Past and present EAC variability and consequent larval transport patterns are identified and associated with physical processes such as the formation and detachment of meso-scale eddies and El Nino Southern Oscillation. Similarly, the effect of future climate scenarios on both the circulation, and larval dispersal, are investigated using hydrodynamic and lagrangian models to envisage changes of marine ecosystems along the south-eastern coast of Australia. Larval dispersal of ecologically and commercially relevant species will be investigated by incorporating their reproductive behaviour and larval life traits (e.g. 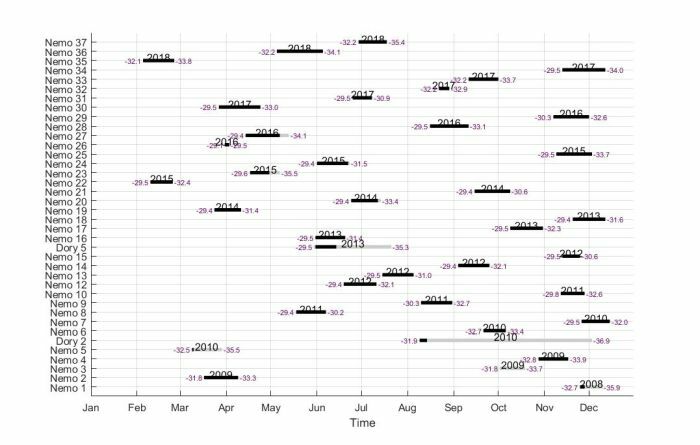 the pelagic larval duration (PLD), swimming behaviour) on simulations of particle transport along the southeastern Australian coast. Realized connectivity from hindcast and forecast simulations will be compared and the effects of changes in ocean currents, water temperature and ocean acidification quantified. In the context of climate change and ocean warming, extreme temperatures are getting more frequent and more intense. These anomalous warm water events are referred to as marine heatwaves and have dramatic consequences on marine ecosystems. Thanks to sustained ocean observations, these events can be identified, not only at the surface but also deeper in the ocean. Key research questions include the spatial and vertical extent of these extremes, their causes (air-sea fluxes or ocean currents) and how to predict them in the future. Along the south-eastern coast of Australia, the ocean dynamics are dominated by the East Australian Current (EAC), the Western Boundary Current of the South Pacific sub-tropical gyre, and its eddy field (anticyclonic Warm Core and cyclonic Cold Core Eddies). The circulation over the narrow continental shelf (~20km) is strongly influenced by the EAC and eddy encroachments, driving intense poleward flows (up to 2m/s) as well as slope water intrusions. In addition, wind stress drives intermittent along-shelf coastal jets, alternating between upwelling and downwelling favourable. In this fascinating environment, interactions between the EAC, coastal and slope waters are complex. Key research questions include cross-shelf dynamics, encroachment variability and frontal eddy formation, with a particular focus on how these processes impact nutrient supply, productivity and biology dynamics. Research is currently underway into the hydrodynamics of the Port Jackson harbour mouth region, to develop understanding of the exchange and impacts between the Sydney Estuary and her coastal shelf oceanography. This is a highly dynamic area affected by estuarine flows, EAC derived North Pacific nutrient-poor waters and on occasion cool upwelled nutrient-rich waters. Numerical ROMS modelling is used to simulate the hydrodynamics and biogeochemistry and for scenario modelling. Small boat surveying of CTD (Conductivity as a proxy for Salinity, Temperature, Depth) and ADCP (Acoustic Doppler Current Profiling) is being undertaken across set transects in a range of situations (eg. high/low rainfall, spring/neap tides). This is complimented by data from moored ADCP's located near the DPI Sydney OAR (Department of Primary Industries Sydney Offshore Artificial Reef) and Sydney's IMOS moorings. UNSW Oceanography, in particular Dr Kerry, operates a regional scale ROMS EAC Model domain with 3 nested domains (Coffs Harbour, Hawkesbury and Narooma) as shown below. More information on estuarine and local models coming soon!